Laser scanning microscopy is emerging as a powerful imaging tool in cryobiology. The basic microscopy system can be combined with various imaging modalities including Raman spectroscopy, fluorescence correlation spectroscopy, fluorescence lifetime imaging, or multiphoton imaging. Multiphoton imaging can be used to study intracellular ice formation at the subcellular level. A Raman imaging modality can be used for chemical mapping of frozen samples. A Raman spectrum gives information about characteristic molecular vibrations of specific groups in molecules. Raman images can be used to determine the localization of intra- and extracellular constituents and the various forms of water in freeze-concentrated solutions. Spectra can be collected during freezing and thawing of a sample using a temperature-controlled sample holder. 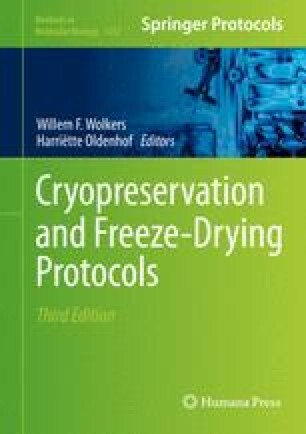 In this chapter, various advanced cryoimaging methods are described. Special emphasis is given on the different imaging modalities that can be used to study the various aspects of cryopreservation.